NAPLES, Fla. (AP) -- Hurricane Wilma plowed into southwest Florida early Monday with howling 125 mph winds and dashed across the state to the Miami-Fort Lauderdale area, shattering windows, peeling away roofs and knocking out power to millions of people. At least one death in Florida was blamed on the storm. By 11 a.m., Wilma's winds had dropped to 105 mph and the hurricane was centered out over the Atlantic, about 15 miles northeast of West Palm Beach. But the big storm was still slamming the state. Hurricane-force winds of 74 mph or more extended up to 100 miles from the center, and tropical storm-force winds over 39 mph stretched up to 260 miles. The same storm that brought ruin over the weekend to resort towns along Mexico's Yucatan Coast came ashore in Florida as a strong Category 3 hurricane, but within hours had weakened into a Category 2 with winds of 105 mph. The hotel zone is destroyed after the passing of Hurricane Wilma on Sunday Oct. 23, in the resort city of Cancun, Mexico. Hurricane Wilma blows gusting winds and floods a street in the resort town of Playa del Carmen, Mexico, on Sunday, Oct. 23. A tourist rides on the back of another as they try to cross a flooded street in Cancun, Mexico on Sunday, Oct. 23 after Hurricane Wilma passed through the area. After two days of high winds and torrential rains, officials began to send out authorities to help some 30,000 people who weathered the storm in sweltering, leaky shelters. The majority are tourists who couldn't be evacuated before the storm hit. A flooded downtown street is seen after Hurricane Wilma passed over Cancun, Mexico on Sunday, Oct. 23. Hurricane Wilma inched away from the Yucatan peninsula on Sunday morning as furious winds and rain continued punishing Mexico's Caribbean coastline, where at least seven people were killed. Click to enlarge. As you can see at this point Wilma is starting to slow down. Click image to enlarge. As you can see at this point Wilma is more powerful then Katrina and larger then both Katrina and Rita. As of 5:00 a.m. EDT Monday, Hurricane Wilma remains a dangerous Category 3 hurricane. Maximum sustained winds are near 125 mph with gusts near 155 mph. The storm was centered near 25.5 north and 82.4 west, or about 55 miles southwest of Naples, Florida. Wilma is moving towards the northeast at 20 mph. The central pressure is 950 millibars, or 28.05 inches of mercury. Hurricane-force winds extend outward up to 90 miles from the center. Tropical storm-force winds extend outward up to 230 miles from the hurricane's center. Wilma's landfall should be near daybreak this morning near Naples with catagory 3 strength winds in the southern eye wall. The wind field will be spread out so the Keys and areas from the hurricane track south and east will receive the strongest wind gusts over 100 mph. Winds north of the center to Tampa will gust to 60 mph with gusts to hurricane force as far north as Vero Beach. Gales will howl along the East Coast to Wilmington NC. Heavy rain of 3-6 inches will occur across central and south Florida Sunday night and Monday with a few locally higher amounts. Winds from the Outer Banks to Long Island, New York Monday night and Tuesday can reach 60 mph in gusts with flooding rains expected. The hurricane itself stays out at sea and becomes the eastern focal point of the large ellipse of low pressure Tuesday night. The winds in the coastal waters of New England will mount to sustained storm force with gusts to hurricane force and seas should rise to near 30 feet. Windswept rains of 1-3 inches should cover much of New Jersey and southeast New York with 3-6 inch amounts in southeast New England. Snows will break out Tuesday in the high grounds from northeast Pennsylvania to central New England. Tourists carrying blankets and pillows wait for their bus Thursday Oct. 20, as they are evacuated from their hotel in Cancun, Mexico to a provisional shelter as Hurricane Wilma approaches the area. 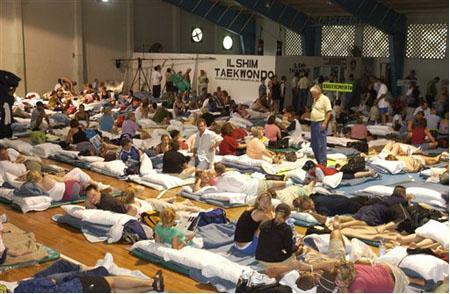 Tourists crowd a makeshift shelter Thursday, Oct. 20, set up inside a gymnasium as Hurricane Wilma approaches in the resort city of Cancun, Mexico. 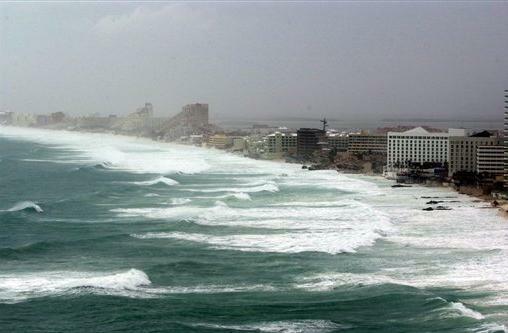 Strong waves batter the resort city of Cancun, Mexico, on Thursday, Oct. 20, as Hurricane Wilma approaches. Click to enlarge. 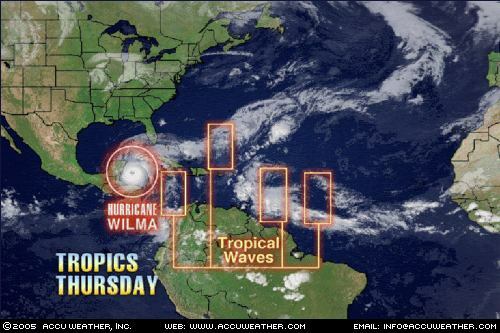 As you can see at this point Wilma is much more larger and powerful then both Katrina and Rita. As of 5:00 a.m. EDT Friday, Hurricane Wilma remained a Category 4 hurricane and had maximum sustained winds near 150 mph. The storm was centered near 20.0 north, 86.2 west, or about 90 miles southeast of Cozumel, Mexico. Wilma is moving northwestward at 6 mph.